There's a blogger over at Boat Bits who has quite a following even though 90% of his short but entertaining posts are about finding the perfect VolksCruiser - a cruiser for ordinary folks, you know, people on a tight budget, tightwads, whatever you want to call them. People like me. Here's my boat, Jakatar, a Corbin 39 - voted the top cruising boat in its range by Cruising World Magazine a number of years ago. Sailing Past Cabo Espichel going to the Algarve. Damn, that's a tall mast. No wonder raising the sail is sweaty work. Anchored in Alvor, Algarve (pre-roller furling days). Installed an Alado furler in 2011. Modified keel, skeg hung rudder, built like a tank...like a killer whale. That's a genuine cruising boat, and it has served me well in all kinds of sea conditions, including a nasty storm. The truth is that I like almost any type of boat: 56-foot luxury yachts, old wooden schooners, sleek sailing machines, fat motorsailers, crusty rowboats and, yes, motorboats...you get my drift. It's been said a million times, but I'll say it again with a new twist: the perfect sailboat is the one tailored to your needs, EVEN IF YOUR NEEDS BOIL DOWN TO SPENDING THE NEXT 10 YEARS FIXING HER UP AT THE YARD OR TINKERING WITH SYSTEMS AT THE MARINA, YAPPING AND DREAMING ABOUT CRUISING BUT NEVER ACTUALLY SAILING ANYWHERE. YOUR NEEDS!!!! THAT'S WHAT REALLY MATTERS. Make sure you scratch the right itch; wouldn't it be silly to have an itchy arm only to find yourself compulsively scratching your leg. Need I say more? 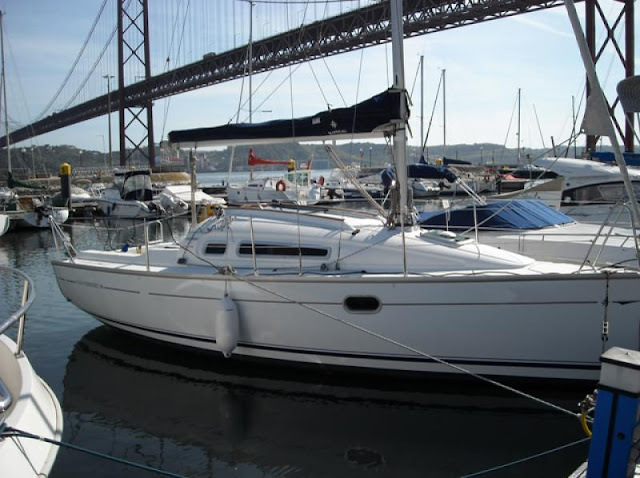 For example, here's the ideal coastal cruiser for single handed multi-leg sailing down the Portuguese coast to the Algarve and surrounding area. Maybe the inmast furling is not a good idea, but the build and design is a tried and proven pleasure machine FOR COASTAL CRUISING. 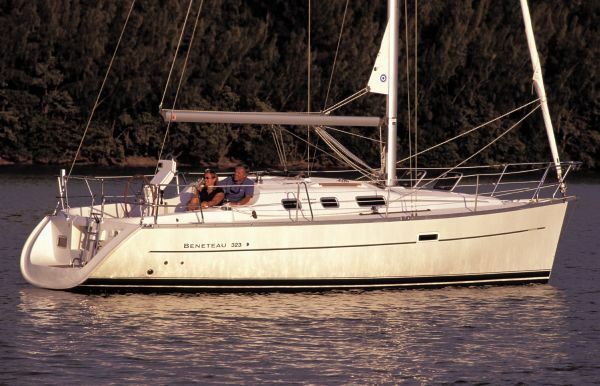 Here's the ideal boat for day sailing or weekends. Jeanneau Sun Odyssey 26. Shall we go sailing this afternoon and forget about her until next week. Now I have to get back to work. These translation deadlines are killing me. Hey Horacio, Jakatar is a beaut! And that mast! "Tank" is the way to go. I went over to boat bits (I had forgotten about him) and got stuck reading 2 hours before commenting here. Great stuff. Did I mention Jakatar is a beaUT!?! Captain Pete, I'll pass on your comments to Jakatar and she'll probrably wiggle her canoe stern. Boat Bits is a bit puzzling - not much personal stuff, just pictures and drawings of FolksBoats and tidbits about boat designs, systems etc. - and yet it's a good read. I kind of look at it as fuel for boat addicts wanting more "boat bits" and daydreaming to keep the boating juice flowing while sitting at home.